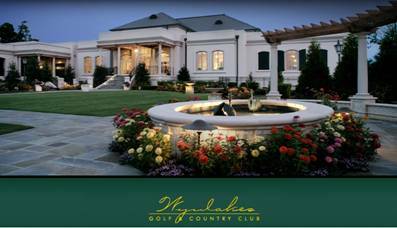 Board of Assistants Meeting – 9:30 a.m.
Place: Montgomery Country Club in the Beauvoir Room. The next State meeting will be Saturday April 29, 2017 at Wynlakes Country Club. We will have a Board of Assistants meeting at 9:30 with the business meeting at 11:30 am. Lunch at 12:00 Noon. 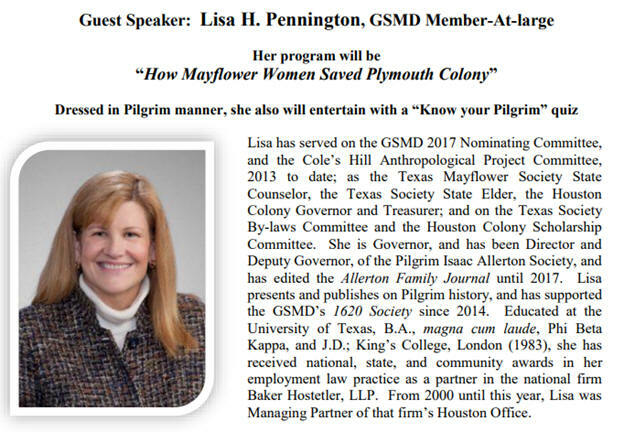 The next colony meeting will be Saturday February 4, 2017 at Montgomery Country Club in the Beauvoir Room. We will have a short business meeting at 11:00 am. Lunch at 12:00 Noon. Our speaker will be Mr. William Dean. Mr. Dean is currently the Associate Professor of Comparative Military Studies, at the Air Command and Staff College, Maxwell AFB, AL and also serves as the Adjunct professor Joint Special Operations University (JSOU), at Hurlburt Field, FL near Fort Walton Beach Florida. He attended the University of the South and received his MA and PHD from the University of Chicago. He served as the Coordinator of Peace War and Diplomacy Studies, Norwich University in Northfield VT and was a Lecturer at De Paul University, Roosevelt Univ., and Lyndon State College. He also received Grants and Fellowships to attend Chateaubriand (French Govt.) and the Air University Foundation Research Grant. Our Meal will consist of Mediterranean Chicken served with Roasted Red Potatoes and Frenched Green Beans and Dessert of Key Lime Pie. The cost will be $28.00 per person. E-Mail address: amd7thcedar@charter.net Telephone No. 334-207-4884 (Cell) or 334-270-8657 (Home) Please leave message if not home. 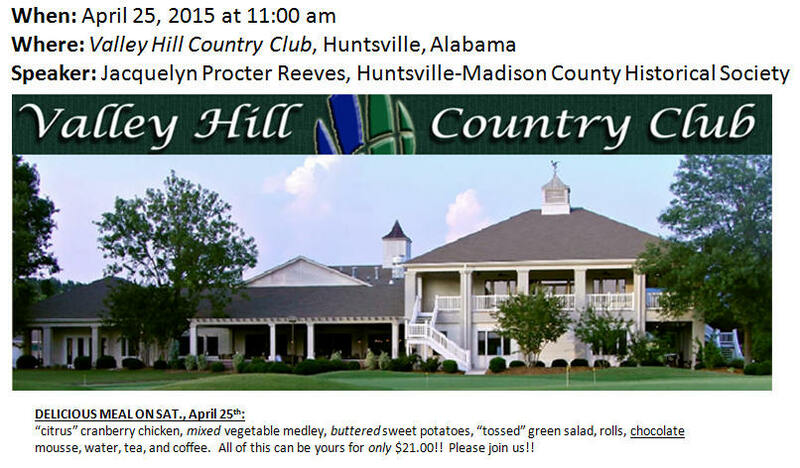 You can pay when you get there and please make the checks payable to the Cahaba River Colony. Board of Assistants meeting at 10:00 am with the meeting starting at 11:00 am. The next colony meeting will be Saturday August 6th 2016 at Montgomery Country Club. We will have a short business meeting at 11:00 am. Lunch at 12:00 Noon. Our speaker will be Ret. Col. Jeffrey Benton who will speak on how our ancestors traveled along the Federal Road to come to Alabama and Westward. Our Meal will consist of Chicken stuffed with Goat Cheese, Apricot and Sage served with Roasted Red Potatoes and French Green Beans Fresh Rolls and Butter. The next colony meeting will be Saturday March 12th 2016 at Wynlakes Country Club. We will have a short business meeting at 11:30 am. Lunch at 12:00 Noon. He is currently the Associate Professor of Comparative Military Studies, at the Air Command and Staff College, Maxwell AFB, AL and also serves as the Adjunct professor Joint Special Operations University (JSOU), at Hurlburt Field, FL near Fort Walton Beach Florida. 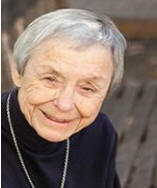 He attended the University of the South and received his MA and PHD from the University of Chicago. He served as the Coordinator of Peace War and Diplomacy Studies, Norwich University in Northfield VT and was a Lecturer at De Paul University, Roosevelt Univ., and Lyndon State College. He also received Grants and Fellowships to attend Chateaubriand (French Govt.) and the Air University Foundation Research Grant. 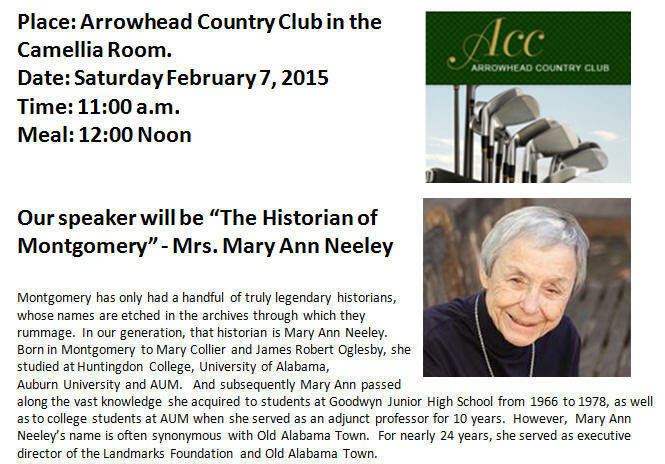 The next colony meeting will be Saturday February 1st, 2014 at Wynlakes Country Club. We will try to have a short business meeting at 11:30 am. Lunch at 12:00 Noon. Our Speaker will be Mr. Bill Stone who has one of the original copies of the Articles of Confederation on loan from a friend to present it to us. Please put the word out and invite all of your family and friends. This is a once in a life time opportunity to see something like this. 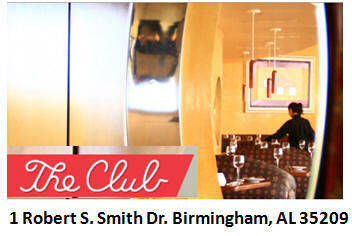 The State Society meeting in Birmingham at The Club, Nov. 23, 2013 at 11:00 am. Board of assistants met at 10:00 am.